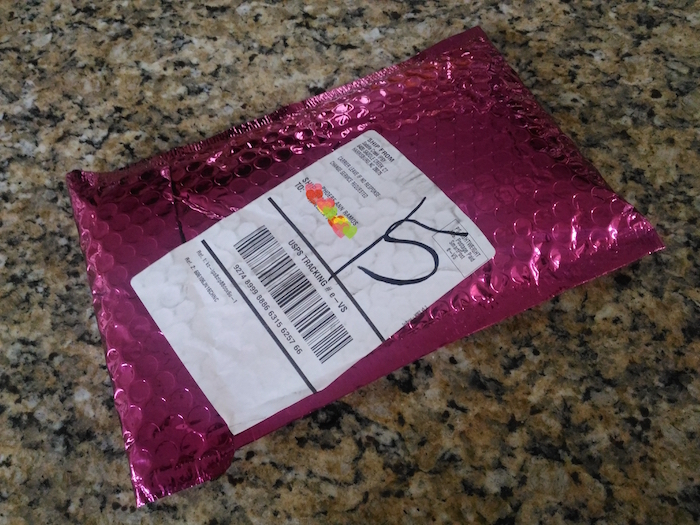 Apart from getting a handful of clothes to get me by, as embarrassing as it is, subscribing to beauty boxes has been one of the first orders of business upon arriving here in the US. I was late for both Sephora Play and Allure Beauty Box but not quite for IPSY. The 2 week wait was long but looking at my stash, I thought it was well worth it. Rodial Stem Cell Cleansing CreamIt’s a cleanser. It’s a mask. It’s a mega moisturizing powerhouse - infused with resilient stem cells from the Alpine Rose to strengthen your skin. Dry spells? Meet the hydration triple threat: advanced stem cell technology, Rose Hip and Vitamin E. Essential nutrients are on the menu. A potent blend of antioxidants, Coconut Oil, Rose Hip Oil, Rose Wax and Coco Butter gives skin a lifted look. Wash away the everyday. Makes your outside as radiant as your inside. Patchology FlashMasque® IlluminateWhen your complexion looks meh, Patchology’s FlashMasques will get you glowing in less time–only 5 minutes to be exact. Advanced masque magic delivers essential ingredients that brighten skin instantly. Use for five minutes. Not for twenty minutes. Not for two days in combination with juicing and yoga. Five minutes only. Licorice and Grapefruit Seed Extracts brighten skin and provide antioxidant protection from environmental junk. No need to rinse. Just rub the serum into your skin and take your fresh glow to go. Doucce Boombastic Lash Volumizer MascaraIt brings the boom. This thickening formula and fat wand work better together. Suddenly, we’ve discovered lashes we never knew we had. Wink. Innovative brush coats all lashes evenly. Won’t smudge or flake. Perfect for all-day wear Carbon-black formula turns up the drama. Urban Decay Eyeshadow in FireballShade shifter. This multifaceted shadow switches up its look in different lighting. Duo the intrigue. Duo the fun. Feels like velvet. Glides on softly. Looks like wow. Lasts all day (and all night). Won’t get caught up in your creases. Fireball is a peachy-gold shimmer shade that transitions to pink tones. Seraphine Botanicals Happy Hibiscus BlushEasy on the cheeks. This sheer rose shade blends smoothly and gets more colorful as you layer it. A foolproof, universally flattering glow. Vibrant pigments adjust to suit your skin tone 99% natural for all you natural beauties Lasts up to 8 hours. A tint that goes the distance. I was tad too excited to receive this pouch and dove right on to everything in one go. 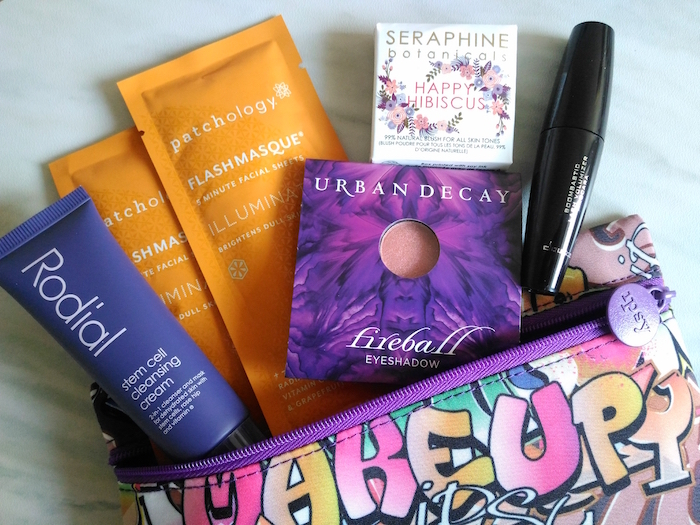 My favourite from the box surprisingly is the Happy Hibiscus Blush. It's flattering against my golden tan and did last from sun up to sun down. The Rodial Stem Cell Cleansing Cream felt great against my parched (in the morning) yet oily (after an entire day outdoors) skin. The Fireball eyeshadow from Urban Decay was so pretty and quite kaleidoscopic -- you can use it alone or for a complex crease work finished off by the super black and volumizing mascara from Doucce. If you need a morning or a road trip pick me upper, the Patchology FlashMasque Illuminate may be your cup of tea since it's neatly packaged and moisturizes dull skin in a flash (pun intended).